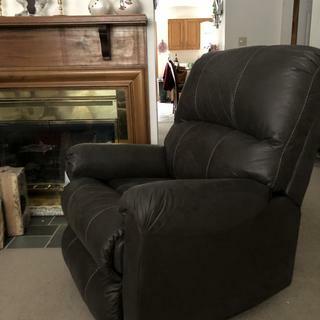 L: 33" x W: 39" x H: 42"
Grenada Rocker Recliner The Grenada rocker recliner brings a fresh, contemporary edge to your home. Wide track arms are ultra-dapper and a great addition to your relaxation. Bustle back with designer stitching doesn’t split on the comfort either. Decadent leather-look upholstery entices you with its good looks and high quality. Once you get a feel, you’ll want the entire seat to yourself. The Grenada rocker recliner brings a fresh, contemporary edge to your home. Wide track arms are ultra-dapper and a great addition to your relaxation. Bustle back with designer stitching doesn’t split on the comfort either. Decadent leather-look upholstery entices you with its good looks and high quality. Once you get a feel, you’ll want the entire seat to yourself. L: 33" x W: 39" x H: 42" Weight: 90 lbs. Finishing touch to our LR refresh. Love our recliner. Finishes of our LR remodel. ???? The delivery people were professional, friendly and quick! The chair is comfortable. It does need to be pulled away from the wall if you want to extend the recliner fully, but it fits a tight space otherwise. The Sofa feels very constable it's excellent. And I love the material Nice. If you are a mom who doesn't have a lot of children. It's very comfortable. I feel completely constable when I sit down and you can fall asleep and the material feels nice and. I like to take care of things so I would like to keep it for a long time. The Grenada Rocker Recliner was a great addition to our living room. It is extremely comfortable and although I was reluctant to purchase a recliner, I'm so glad I did. My family and I enjoy that it reclines pretty far back and is also able to rock back and forth. I would recommend this product to anyone looking for a reasonably priced recliner. Would you take away an old recliner? BEST ANSWER: Hi Sue. We will only remove an old mattress and box spring with the purchase of a new mattress and box spring set. We do not provide services to remove any other furniture items. For other furniture removal, we suggest contacting a local charity or rescue mission.